Austin Nevin, chemist and conservator, is a Researcher at the CNR-IFN where he has worked since 2011, and he is the coordinator of the CNR-IFN research group for the FUTURAHMA project. 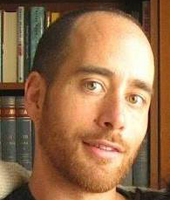 His research focuses on the analysis of paintings and painting materials, and the study of ancient and modern cultural heritage using optical and spectroscopic techniques. He is the co-author of over 40 publications, one of the editors of the Springer series Cultural Heritage Science and a member of the permanent scientific committee of the LACONA and of the TECHNART conferences. He has served as the coordintor of the Scientific Research Working Group of ICOM-CC (from 2011-2014) and is a Council Member and Fellow of the IIC (since 2013). Following a degree in Chemistry (Mchem) from the University of Oxford (2001) and a 3-year MA in the Consrvation of Paintings (Wall Paintings) from the Courtauld Institute of Art (2004), Nevin went on to obtain a PhD from the Courtauld entitled “Fluorescence and Raman Spectroscopy for the analysis of proteinb-based binding media” (2008). Between 2004-2007 he won a Marie Curie Early Stage Training Fellowship at IESL-FORTH (Greece) where his research focussed on the analysis of paintings using laser-based techniques. Contribution to some records and Fluorescence Lifetime Imaging (pp. 98-99) in More than Meets the Eye: New Research on the Estorick Collection, edited by R. Cremoncini and M. Patti, catalogo della mostra, London, Estorick Collection, 23 settembre – 20 dicembre 2015, Estorick Collection, London, 2015. A. Nevin, G. Spoto, D. Anglos, Laser spectroscopies for elemental and molecular analysis in art and archaeology, «Applied Physics A: Materials Science & Processing», 2012, pp. 1-23. D. Comelli, A. Nevin, A. Brambilla, I. Osticioli, G. Valentini, L. Toniolo, M. Fratelli, R. Cubeddu, On the discovery of an unusual luminescent pigment in Van Gogh’s painting “Les bretonnes et le pardon de pont Aven” , «Applied Physics A», 106, 1, 2012, pp. 25-34. M. Thoury, J.P. Echard, M. Réfrégiers, B. Berrie, A. Nevin, F. Jamme, L. Bertrand, Synchrotron UV− Visible Multispectral Luminescence Microimaging of Historical Samples, «Analytical Chemistry-Columbus» 83 (5), 1737, 2011. D. Comelli, A. Nevin, G. Valentini, I. Osticioli, E.M. Castellucci, L. Toniolo, D. Gulotta, A. Gallone, R. Cubeddu, Insights into Masolino’s wall paintings in Castiglione Olona: Advanced reflectance and fluorescence imaging analysis, «Journal of Cultural Heritage» 12 (1), 2011, pp. 11-18. A. Nevin, D. Comelli, G. Valentini, R. Cubeddu, Total synchronous fluorescence spectroscopy combined with multivariate analysis: method for the classification of selected resins, oils, and protein-based media used in paintings, «Analytical chemistry» 81 (5), 2009, pp. 1784-1791. I. Osticioli, N.F.C. Mendes, A. Nevin, F.P.S.C. Gil, M. Becucci, E. Castellucci, Analysis of natural and artificial ultramarine blue pigments using laser induced breakdown and pulsed Raman spectroscopy, statistical analysis and light microscopy, «Spectrochimica Acta Part A: Molecular and Biomolecular Spectroscopy» 73 (3 ), 2009. J.M. Manceau, A. Nevin, C. Fotakis, S. Tzortzakis, Terahertz time domain spectroscopy for the analysis of cultural heritage related materials, «Applied Physics B: Lasers and Optics» 90 (3), 2008, pp. 365-368. A. Nevin, I. Osticioli, D. Anglos, A. Burnstock, S. Cather, E. Castellucci, The analysis of naturally and artificially aged protein‐based paint media using Raman spectroscopy combined with Principal Component Analysis, «Journal of Raman Spectroscopy» 39 (8), 2008, pp. 993-1000. D. Comelli, G. Valentini, A. Nevin, A. Farina, L. Toniolo, R. Cubeddu, A portable UV-fluorescence multispectral imaging system for the analysis of painted surfaces, «Review of Scientific Instruments», 79 (8), 086112-086112-3, 2008. I. Osticioli, A. Nevin, D. Anglos, A. Burnstock, S. Cather, M. Becucci, C. Fotakis, Micro‐Raman and fluorescence spectroscopy for the assessment of the effects of the exposure to light on films of egg white and egg yolk, «Journal of Raman Spectroscopy» 39 (2), 2008, pp. 307-313. A. Nevin, D. Anglos, S. Cather, A. Burnstock, The influence of visible light and inorganic pigments on fluorescence excitation emission spectra of egg-, casein-and collagen-based painting media, «Applied Physics A: Materials Science & Processing», 92 (1), 2008, pp. 69-76. A. Nevin, J.L. Melia, I. Osticioli, G. Gautier, M. P. Colombini, The identification of copper oxalates in a 16th century Cypriot exterior wall painting using micro FTIR, micro Raman Spectroscopy and gas chromatography-mass spectrometry, «Journal of Cultural Heritage» 9 (2), 2008, pp. 154-161. C. Martin de Fonjaudran, A. Nevin, F. Piqué, S. Cather, Stratigraphic analysis of organic materials in wall painting samples using micro-FTIR attenuated total reflectance and a novel sample preparation technique, «Analytical and bioanalytical chemistry» 392 (1), 2008, pp. 77-86. A. Nevin, D. Comelli, G. Valentini, D. Anglos, A. Burnstock, S. Cather, R. Cubeddu, Time-resolved fluorescence spectroscopy and imaging of proteinaceous binders used in paintings, «Analytical and bioanalytical chemistry» 388 (8), 2007, pp. 1897-1905. A. Nevin, I. Osticioli, D. Anglos, A. Burnstock, S. Cather, E. Castellucci, Raman spectra of proteinaceous materials used in paintings: A multivariate analytical approach for classification and identification, «Analytical chemistry» 79 (16), 2007, pp. 6143-6151. A. Nevin, P. Pouli, S. Georgiou, C. Fotakis, Laser conservation of art, «Nature Materials» 6 (5), 2007, pp. 320-322. A. Nevin, S. Cather, D. Anglos, C. Fotakis, Analysis of protein-based binding media found in paintings using laser induced fluorescence spectroscopy, «Analytica chimica acta» 573, 2006, pp. 341-346.